I want to add new info for each product -> "CODE PRODUCT"
I hope it can be showed in the square where shows "ADD TO CART", "QUANTITY AVAILABLE", etc. Btw, I do not use the attributes "color", "size", "shipping cost". Perhaps i can rename one of these attributes and put "Product Code". I think your own suggestion would be the easiest. Just do a search for these lines, and replace the Text that shows. Save the file, and that should do it. Perfect, but i have problem. I need to show "Código Producto" but instead i see "C?digo Producto". I think its cause of "TILDE" or "ACCENT" of the word "código". If I put the ampersand in here before the number, you wouldn't see the character code. You would only see the " ó "
But, without all the spaces in between. By the way, i need the "Product Code" shows without the "arrow" or the possibility to select, cause there is only one code per product. What i have to modify (i change "COLOR" on english.php as you recommend me). Yes, if you will not be using the "Color" option, then you can just use that for your Product Code field. You would just change the label so instead of displaying the word "Color", it would display something like "Product Code". Then, in the Administration page for the product, as long as you only enter 1 value for the Product Code field, the user will only be shown one value -- and will not have the ability to select anything different. This post may help. It talks about modifying the "Size" option attribute, however you can use the same process for altering the "Color" option attribute as well. I mean the arrow still appear at right side of "Código producto". As you can see in the attached picture, the arrow still there. 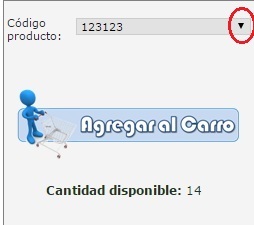 I want to remove the "arrow" (at the right side of the "Código Producto"). That can't be removed without altering the code behind the pages. Right now, your customer cannot change the option to anything else -- so it's not going to harm anything as it is.